In 1912, physicist Theodore von Kármán, a Hungarian-American physicist, was the first to describe the physical processes that create long chains of spiral eddies like the ones shown above. 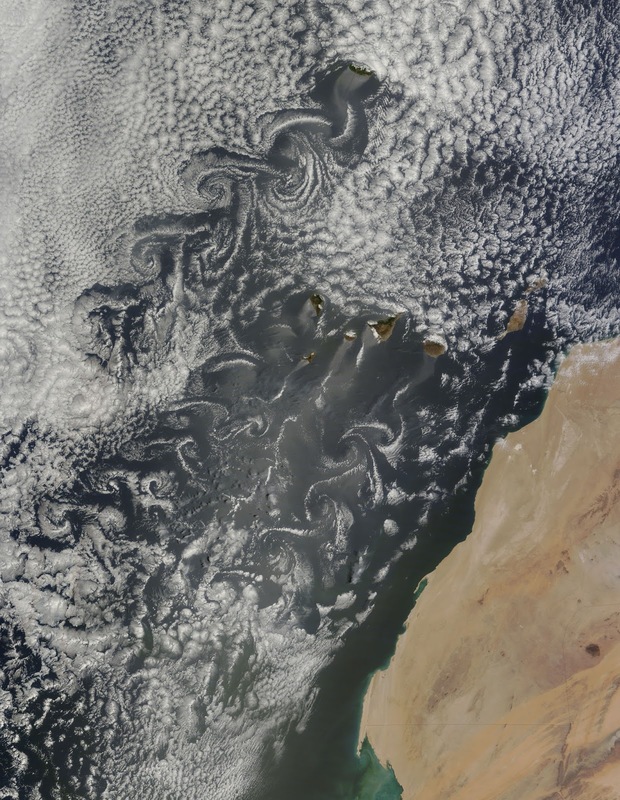 Known as von Kármán vortices, the patterns can form nearly anywhere that fluid flow is disturbed by an object. 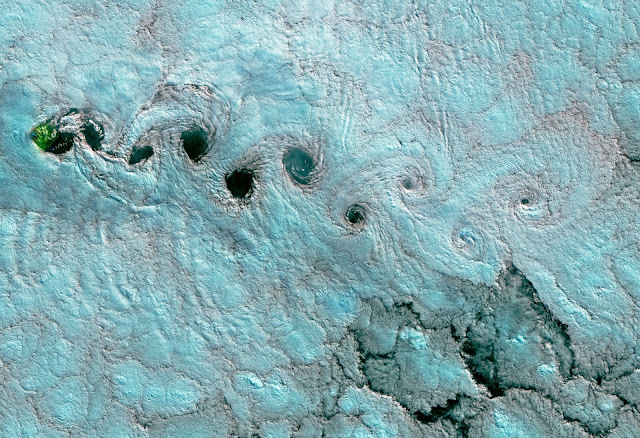 “von Kármán vortices” arise when winds are diverted around a blunt, high-profile area, often an island rising from the ocean. The alternating direction of rotation in the air forms swirls in the clouds. In this case, the unique flow occurs as winds rush past the tall peaks on the volcanic islands. 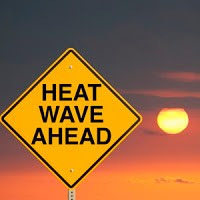 As winds are diverted around these high areas, the disturbance in the flow propagates downstream in the form of vortices that alternate their direction of rotation. the Visible Infrared Imaging Radiometer Suite (VIIRS) on the Suomi NPP satellite captured a natural-color image (top) of such swirls on the lee side of Guadalupe Island. 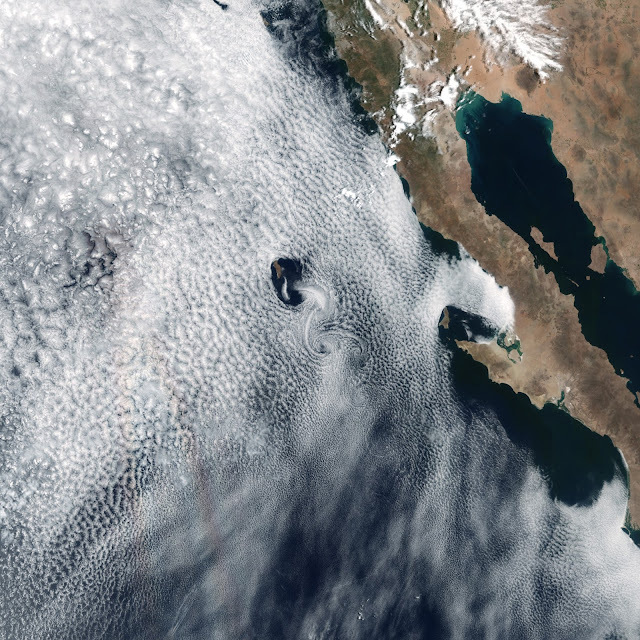 The volcanic island rises from the Pacific Ocean off the coast of Baja California, Mexico. The second image shows the same phenomenon occurring an ocean basin away, on the lee side of Tristan da Cunha—a remote volcanic island in the South Atlantic. The image was captured on June 25, 2017, by the Operational Land Imager (OLI) on the Landsat 8 satellite. The image is false-color (OLI bands 6-5-3) to better distinguish areas of land, water, and clouds.